Lubon staffs attend the first aider training at 9:00 a.m. Jul. 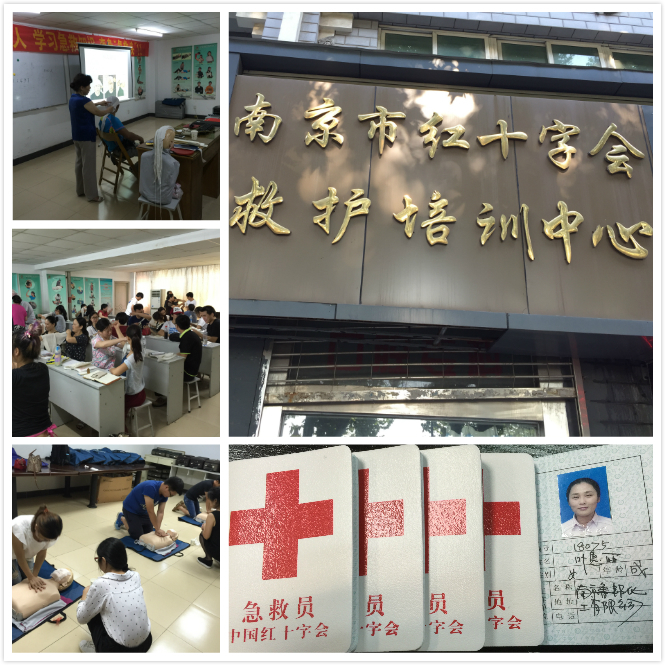 23, 2016, after the 2 days training of CPR (cardiopulmonary resuscitation), trauma first aid, and the automated external defibrillator, all the staffs passed the test, and got the first aider certificate which issued by the Red Cross Society Of China. What a nice weekend! We all love it! This entry was posted in COMPANY NEWS on July 25, 2016 by lubon. Using sulfamic acid as a cleaning agent, because it is a solid, with storage and transportation is convenient and easy manufacture, and many other advantages, especially for the long haul. The cleaning agent of the amino sulfonic acid is widely used, and can be used for cleaning the boiler, the condenser, the heat exchanger, the jacket and the chemical pipeline. Lu; cool, remove the air conditioning evaporator in beer factory use it for cleaning glass lined tank, pot, open beer cooler, beer barrel fouling; cleaning enamel factory, and paper mill equipment, etc. ; in the cooling system of evaporative condenser of rust and scale; sea going ships use it can remove water evaporator (distillation equipment, heat exchanger and the brine heater in seaweed, scale, can clean the brass, radiator, tableware washing mechanism, silverware, toilet, tiles, food and dairy processing equipment of scale can be cleared by a deposition in the digester protein and meat, vegetables and cheese processing plant used in disinfection of sediments. The United States Department of agriculture to use amino acid in fresh meat, poultry, rabbit, egg processing enterprises for acid cleaning agent. The shell of the car first electroplating tin zinc alloy, then paint, paint film adhesion will increase. Gold plated or alloy commonly used amino sulfonic acid, gold, silver, gold and silver alloy electroplating solution is containing amino sulfonic acid 60 ~ 170 grams of each litre of water. Typical electroplating silver needle is female clothing each litre of water containing 125 grams of amino acid, can obtain very bright silver surface. Alkaline metal amino sulfonate, amino sulfonic acid ammonium or amino sulfonic acid can be used as conductive and buffering compound in the new water bearing gold plating bath. When the nickel plating waste liquid is recovered, the resin is washed with the cation exchange resin, and the resin is cleaned by the amino sulfonic acid, and the adsorption desorption is made. Such as electroplating wastewater treatment 400ppmNi, 150 g / L of amino sulfonic acid 50ml and recovery (NH2SO3) 2112 g / L, NiSO4148 g / dl. In the nickel component repair need nickel nickel, in the anode processing available 100 g / L of amino sulfonic acid treatment. With 0.003 to 0.1 moles of amino sulfonic acid cleaning solution in nickel plating nickel plating on the surface of the. Copper plating of the amino acid content of 3 to 20 liters, the role of amino sulfonic acid is the coating is dense and malleable, the viscosity is high. Iridium plating when NH2SO3H/Ir is more than or equal to 7, of iridium coating can be obtained without crack, the iridium layer thickness of 15 microns, the big stick relay. The product has automatic anti pollution equipment showed good activity. In silver, electrical apparatus elements rhodium plating rhenium alloy, electroplating solution containing amino sulfonic acid as 100 g / L, when the coating thickness is less than or equal to 5 um has very high hardness and strong corrosion resistance and electric plating is very bright and beautiful. In the brass is smooth and beautiful rhodium and rhenium electroplating layer hardness high, corrosion, electroplating solution containing amino sulfonic acid 100 g / L, 50 g / L sulfuric acid, rhodium (such as sulfate) 2 g / L, rhenium (such as 0.05 g / L 2] k3n RuCl4H2O2, in 65 DEG C and 1 ~ 2 ANN / DM 2 conditions, deposition rate of 3 ~ 4 mg / law-abiding. Italy has been using amino sulfonic acid lead bath instead of fluorine acid bath, can reduce pollution. There are many uses in the anti corrosion aluminum industry. Product luster good, good processing performance. Amino sulfonic acid is cheap and easy to get and stability of solid acid, the esterification of organic acid has a good catalytic effect, and no corrosion equipment. This entry was posted in COMPANY NEWS on May 13, 2016 by lubon. A few days ago, by the Tangshan Hebei inspection and Quarantine Bureau of qualified, the area of a number of hazardous chemicals industrial grade amino sulfonic acid exports to Italy. This batch of goods by the Lubon North-China Co.,Ltd, a total of 48 tons, the value of more than 40000 dollars, has the completion of the inspection and the smooth export. This entry was posted in COMPANY NEWS, INDUSTRY NEWS on April 25, 2016 by lubon. According to the database of Zhongshang Industrial Research Institute, 2016 a quarter of exports of magnesium sulfate points ranked in the top 10 in the country followed by Zimbabwe, Hong Kong, Mozambique, Brunei, South Africa, Sri Lanka, Pakistan, the Philippines, Iraq, and Chile. This entry was posted in COMPANY NEWS, INDUSTRY NEWS on April 5, 2016 by lubon. Magnesium oxide method flue gas desulfurization is a mature technology, economic reasonable, reliable operation of wet desulfurization technology, using cheap, low grade industrial magnesium oxide MgO85% as a desulfurization agent, especially suitable for magnesium mineral rich areas. Magnesium desulfurization by-product mainly for Magnesium Sulfate, the common way to deal with a direct way to abandon the law, Magnesium Oxide regeneration method, Magnesium Sulfate recovery method. Direct abandonment process is simple, but the waste of resources, emissions by GB 8978 “sewage comprehensive emission standards” appropriate treatment, discharge standards, more common in small desulfurization system. Magnesium Oxide regeneration method is the MgSO4 and MgSO3 calcination decomposition, recycling MgO for desulfurization, recycling SO2 used for the production of sulfuric acid, complex process, high cost of renewable, suitable for sulfuric acid industry desulfurization system. Magnesium Sulfate recovery process is also more complex, but the value is high, the prospect is broad, applicable to large and medium-sized desulfurization system. The conventional recovery process of magnesium desulphurization by-product (Magnesium Sulfate) generally increases the additional evaporation crystallization heat source, the energy consumption is higher, not the economy. Lubon North-China for large-scale magnesium method desulfurization system design in the seven water magnesium sulfate purification process available minimal investment, to the lowest operating cost and the minimum equipment failure rate, high-quality products, magnesium sulfate heptahydrate income in line with industrial grade heptahydrate magnesium sulfate quality refers to the standard (see table). For the refining technology of desulfurization by-product magnesium sulfate heptahydrate, to ensure the quality of products, is the key for the removal of heavy metal ions, by Newth Taryn integration tower, also dust removal, desulfurization, and do not interfere with each other. To be flue gas in most of the dust and heavy metal ions removal has been immediately desulfurization produce magnesium sulfite, oxidation obtained magnesium sulfate solution, magnesium sulfate after pre processing, crystallization refining, centrifugal separation and drying process, industrial grade magnesium sulfate heptahydrate. Among them, the heat required for Magnesium Sulfate crystallization system comes from boiler flue gas waste heat, greatly reduce energy consumption. This entry was posted in COMPANY NEWS on March 10, 2016 by lubon.